This tutorial will show you step by step how to make someone an administrator on Twitter. And this tutorial will also show you how to share a Twitter account with multiple users. 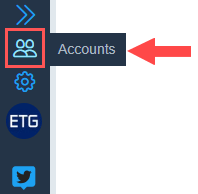 You can easily and quickly add users and another admin to a Twitter account by using the free online service TweetDeck. TweetDeck allows you to view multiple timelines in one interface. It includes few advanced features to help you get the most of Twitter. 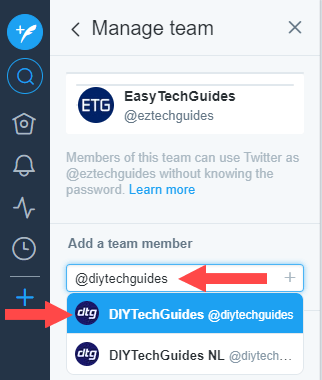 You can use TweetDeck to manage multiple Twitter accounts, add contributors and administrators, schedule Tweets for posting in the future, build Tweet collections, and more. By adding contributors, you can share and manage a Twitter account with multiple users. 1. Go to https://tweetdeck.twitter.com (TweetDeck). 2. Log in to TweetDeck with the Twitter account you wish to add a user. 3. Click on Accounts located at the bottom of the left navigation bar. 4. 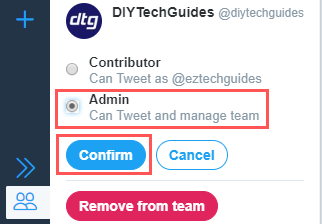 At the account you want to add a user to, you click on Manage team. 5. Enter the name or @username of the user you want to invite in the Add a team member field and then click on the user's name when it appears. 6. Click on the Authorize button. This person will now receive an email and also an invitation on TweetDeck and they will need to accept the invitation. 5. Click on the Change role link located at the username you want to add as an admin. 7. Click on the Confirm button. This person will now be an administrator of your Twitter account.